Some of my favorite sessions tell the story of a family's "normal" Saturday. When you read that, did you wonder how your typical Saturday could ever be viewed as a story, let alone a beautiful one like I claim all of these stories I tell are? When you think of a typical Saturday in your life (or whatever day your family is all together), you probably think of the food you have to make, the errands you run, the cleaning you do, the trips to the park to get your kids' energy out, the shuffling of kids to different sports, relaxing at home, and every other thing that happens that seems so...bland. Allow me to shed some light on that for you. There's a problem with our perspectives, though. They're tainted. As adults we don't typically look at the things that happen repeatedly in our lives and grow excited. I have yet to meet a Michigander that is just as excited about a snowstorm in late April as they were at the first snowfall of winter. Yet every time it snows (even today, on the first day of March), my kids squeal and talk about how beautiful the snow is and how they can't wait to play in it. Every. Time. Through my own experiences as a mother, and through my work, I've learned that life is so much more special, more magical, and more meaningful when it's viewed through a child's eyes. So when I talk with clients and meet with them to plan their session, I think and ask about the perspectives of their children. We talk about how their children might identify themselves once they're older and what memories they'll carry with them from their childhood. We plan their session according to what makes the entire family tick, but I tend to focus on those "mundane" activities and tasks because for our kids, they're pivotal moments. And after the session, the parents almost always realize that those moments are pivotal for them, too. This family's Saturday session is one of my favorites. I showed up just after everyone had eaten and gotten ready for the day. We had decided beforehand to photograph something that happens weekly in this family's home. But I'll let Mom, and the photos, tell the story for me. 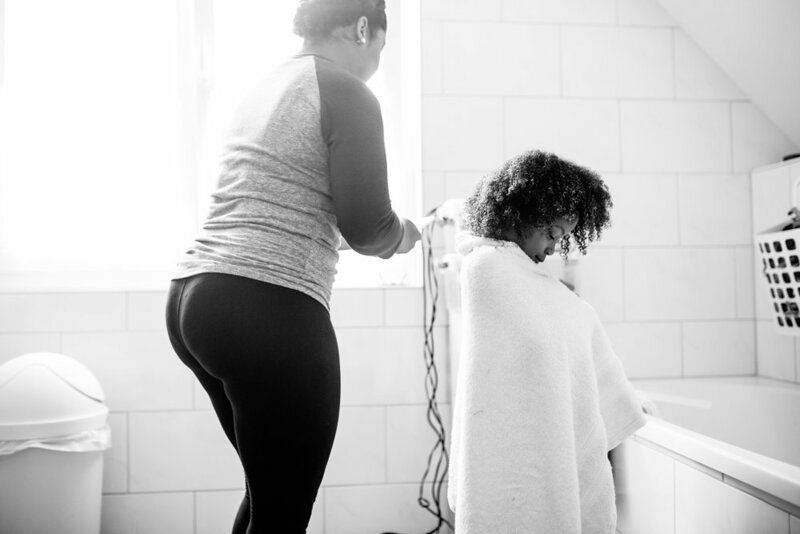 "Saturdays are the days my daughter gets her hair washed and styled. I love this time. My husband will usually cut my son's hair. I just love watching his face when he sees the cool style Daddy did for him! Saturdays are definitely my favorite; the only day where chaos doesn't seem to exist." Don't discount your "normal." It's changing lives. And I say this as much to myself as I say it to you: give seeing things through your children's eyes a try sometime. That changes lives, too. Maybe you've looked at your time with your family and thought the same things I mentioned at the beginning of this blog: that there's nothing special about your family, you do normal things together, and there's nothing to photograph. I'd like to help you change that perspective. Sit down and talk with me. Let me show you the beauty in your story.